The IBJJF Chicago Open goes down this weekend and it's always worth keeping an close on on the colored belts. 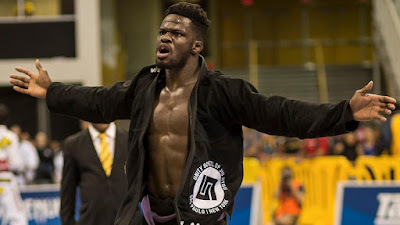 They put on some amazing matches, and following these up-and-comers enables us to predict who'll shake up the black belt divisions come promotion time. At brown belt, anything besides double gold for Devhonte Johnson from Unity BJJ in New York would be shocking. After a dominant year at Purple capped off by a 2017 World super-heavyweight title, he received his brown belt from Murilo Santana. He should be the favorite not only for this tournament but also at the worlds in the super-heavyweight division in 2018. Purple belt is shaping up to be an inevitable clash between two titans of their divisions, Mauricio Oliveira from GF Team and Andrew Wiltse from Pedigo Submission Fighting. Oliveira was the 2017 world champ at middleweight, Wiltse was the runner up at medium-heavyweight. They have since swapped weights with Wiltse registered at middle and Oliveira at medium-heavy for Chicago. Wiltse has always looked flawless in Chicago, having won 14 gold medals at this tournament without ever losing. The only ever meeting between them resulted in a win by advantage for Oliveira at the 2016 worlds as blue belts. Wiltse will be looking for revenge and to defend his run of open division titles at the Chicago Open from the incredibly tough Oliveira. The purple belt featherweight division should be exciting and a hard fought title to achieve. 2017 blue belt featherweight world champ Israel Sousa from GF Team, Matheus Gabriel from Checkmat and Joao Pedro Figueredo from Gracie Barra are elite competitors and any one of them could come out on top of the podium. Two other purple belts to watch are the always extremely active competitors from Cicero Costha, light-featherweight Jonas Andrade and lightweight Italo Moura.